Bryan Reel is Scantron’s Chief Technology Officer responsible for the strategic long-term goals, policies, and procedures for the IT department. 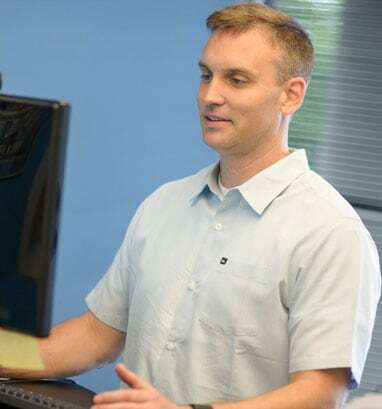 In addition to overseeing the organization’s systems needs analysis, acquisition, and maintenance of all information processing equipment, he also works closely withScantron’s clients to identify their unique technology needs and to explore options for configurable technology solutions. We recently sat down with Bryan to get his perspective and thoughts on what differentiatesScantron from its competitors and the present challenges within the certification and licensure testing industry. Todd: Bryan, I asked you a question recently and was surprised by your answer. What makes Scantron different from our competitors? I think most people would assume when asking a Chief Technology Officer about what makes their organization different, in one way or the other, he would respond speaking to something about their technology. However, you did not. Could you share your answer? Bryan: Sure, I think there are a number of things about Scantron’s technology that differentiates us from our competitors, but I believe the true differentiator forScantron is the integration between the IT and Psychometrics teams. From the time Scantron opened its doors 30 years ago until today, these departments have been separated by less than 100 feet in our offices. Scantron understands that Psychometrics and Technology needed to work hand-in-hand to develop a sophisticated suite of products that deliver the wants and needs of our client’s in certification and licensure testing. Our secret sauce is the fact that IT and Psychometrics have been integrated since day 1! Todd: Why should the integration of the Psychometrics and IT teams be so important to organizations looking for a certification and testing vendor? Bryan: It’s important for any organization to understand how their certification testing vendor has developed and grown. For example, Scantron’s growth has been organically driven based on our clients’ needs and requirements. We offer a single interface into all of our services while a majority of our competitors cannot say that. Many, if not all of Scantron’s competitors’ growth have been driven by acquisitions of other companies. While this allows a company to grow quickly, it also creates significant technology integration challenges. Often these semi-compatible tools and systems are masked in such a way so they appear to work together but underneath there are significant issues. This is why it’s so important to understand the histories of prospective vendors. Todd: Staying on the subject of challenges, what’s one of your top challenges for you and your team? Bryan: I think that in this day and age where technology allows us to provide an enormous amount of choices on how to best serve our customers, technology also challenges us with how to best provide data security while mitigating risk. It seems we don’t go a day without hearing in the news about someone’s data being hacked or exposed. My team and I have spent a great deal of time ensuring we put vulnerabilities and high points of emphasis as close to our control as possible which is a challenge when you offer online and offline testing solutions across the globe. Todd: If you were working with an association that was looking at testing vendors, what questions would you ask to determine if they were the right vendor for you? Who are the experts within your company? How long have they been with your company and what makes them experts? And, will my team be able to interact with those experts on a regular basis? How do you determine your investment in technology within your company? Is it a dollar figure or a percentage of revenue? How do you decide what is spent on R&D? And, finally, I would require the vendor to get their tech team on the phone with my tech team. I have found this to be an important request as a number of vendors in this space outsource or farm-out their technology to outside companies. There are some services that can be farmed-out, but there are many that I would not be comfortable with farming-out due to their “mission-critical” nature for both the client organization and their customers. Todd: Thank you for your time and sharing your insights, Bryan. I would encourage any testing organizations considering the use of technology in any capacity for their program to contact either of us here atScantron via email or phone or, please feel free to explore our website more.